Super typhoon Seniang forming and may hit Cebu and Visayas region, Philippines December 6 - 8, 2014 Updates. 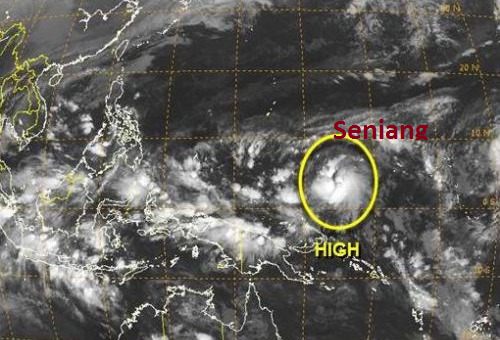 The supertyphoon Seniang news became viral and popular online and made some people worried about the possible typhoon. PAGASA Visayas director Oscar Tablada confirmed in a report posted on Banat News of PhilStar Cebu. There are two LPAs spotted outside Philippine Area of Responsibility (PAR), one will be named typhoon Ruby following another LPA which will be called Seniang. Both typhoons are expected to be strong but Seniang is different as it already gain strength while moving to Philippines. Ruby will be felt starting this December 4-5, 2014. According to Director Oscar Tablada, he fears that the path of Bagyong Seniang will follow the track of Bagyong Pablo, one of the strongest typhoon that hits Mindanao two years ago. Bagyong Pablo was packed with 280kph speed during its devastation in Mindanao last December 3, 2012. The LPA which is forecasts to form into a super typhoon has some similaraties with Bagyong Pablo, the site of its origin was the same, formed near the center of the equator at the Pacific Ocean. The original forecast destination of Bagyong Pablo was the Province of Cebu and the entire Central Visayas but when it made a landfall it changed its course and devastates the provinces of Davao Oriental and Compostela Valley. The LPA was likely to dissipate or continue to cross Southern Luzon towards the West Philippine Sea, where it could regain strength, he said.